All toothpaste has some type of abrasiveness to it especially when coupled with a toothbrush; just how abrasive that can be is measured by RDA (Relative Dentin Abrasion). The ADA created a range of abrasivity that rates different toothpastes and their effect on the teeth. Their list ranges from 0-250 and is broken into 4 sections (Low Abrasive to Regarded as a Harmful Limit). Enamel is not as susceptible to abrasion (the wear on the teeth from a mechanical source, like a toothbrush with toothpaste) because of the hardness of the structure. The underlying structures of enamel like dentin and the root surfaces, which is much softer then the enamel portion of the tooth are affected by how abrasive a toothpaste is. 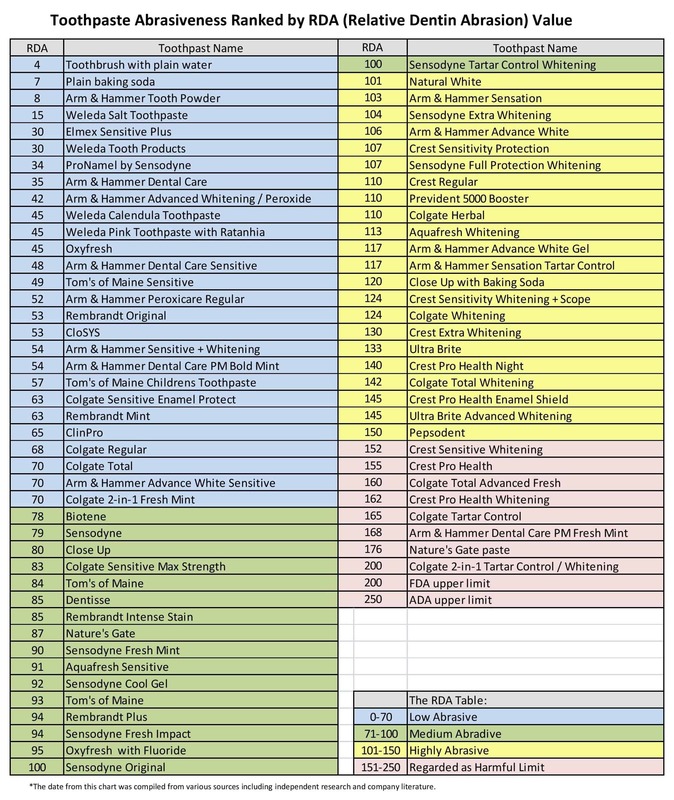 We recommend trying to use toothpaste that is in the 0-70 range (blue section) on the RDA Value List along with a soft/extra soft toothbrush and a gentle, but thorough, touch. An easy way to test toothpastes abrasiveness at home is with a little DIY. Using a piece of tin foil (shiny side up), rub your toothpaste with the tip of your finger using light pressure. Rinse the toothpaste off the foil under running water and see if any scratches remain on the surface of the foil. This is a great way to test multiple toothpaste’s at home that you may already have! We tried this test in our office and had great results! Check out the pictures below from our experiment! Step 1: Rub your toothpaste with the tip of your finger using light pressure. Step 3: See if any scratches remain on the surface of the foil. The foil on the left is the control foil and has not been tested with any toothpaste. The more abrasive toothpastes are on the right, where you can see the scratching/dulling of the tin foil.